In Voyager, we primarily see various gourds and other alien vegetables in Neelix's kitchen, and most of the food we see replicated is vegetarian, like an instance of Paris ordering tomato soup, though Paris also does at one point express a craving for pepperoni pizza, and Neelix in another episode regrets to inform the Markonian visitors that has has run out of "marsupial surprise". In ST VI, the dinner scene shows mostly unrecognizable blue food, probably a pasta of some sort, and nothing identifiable as meat. Similarly, in the galley scene later in the same movie, most of the food seen is either vegetable or baked goods. ST IV has the pizza and beer scene, and of course they have to take the pizza to go, so we don't know if Kirk likes pepperoni (Memory Alpha asserts that Kirk, despite claiming to like Italian, was unfamiliar with the size of a full pizza). I can't remember much eating in TNG (Captain Picard seems to subsist solely on Earl Grey tea IIRC); what I do remember humans eating was mostly unrecognizable, but definitely not meat. The main source of meat-eating in the canon is in DS9 (which in general has a lot of societal differences, like the existence of real money, from other ST series): Sisko's father is a Louisianan, and has a Creole restaurant in New Orleans, which from our sensibilities would almost certainly include fish and shellfish, but maybe not. In the episode of Worf's "bachelor party" and wedding we see plenty of meat, which O'Brien and Bashir certainly don't turn their noses up at, but it is a Klingon ritual after all (however Bashir proceeds to order a steak from Quark when it looks like the wedding's off). Most of the canon takes place aboard ship; even for senior officers, meat aboard a starship 1000 light-years from the nearest industrialized planet, would be a rare delicacy. The human race, in its societal turnaround from near-self-destruction after meeting the Vulcans, largely lost their taste for red meat, focusing on different, possibly less environmentally harmful, forms of agriculture. Earlier canon seems to indicate more the latter, while episodes and movies written after Roddenberry's death seem to take more license and the lack of meat is due to practical diufficulties. Anyone have any official sources on this topic? In the episode of Worf's "bachelor party" and wedding we see plenty of meat, which O'Brien and Bashir certainly don't turn their noses up at, but it is a Klingon ritual after all (however Bashir proceeds to order a steak from Quark when it looks like the wedding's off). That alone seems fairly definitive to me. Long-time vegetarians have some difficulty digesting meat, and are unlikely to order a steak. In TNG 1x07, Lonely Among Us, Riker claims that humans eat only replicated meat (However, this may have simply been to placate the Anticans). 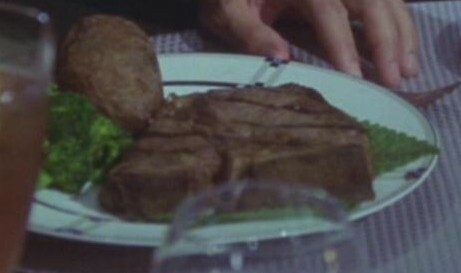 In TNG 4x12, The Wounded, O'Brien claimed that his mother used real, unreplicated meat when cooking. He also enjoys bacon and eggs for breakfast. In TOS 2x13, The Trouble with Tribbles, Kirk ordered a chicken sandwich from the food synthesizer. He was quite dismayed to get tribbles instead. In DS9 4x06, Starship Down, Sisko asks Kira to get the hot dogs from Quark's (and has to reassure her that no, it isn't a heated canine). In VOY 6x24, Life Line, Dr. Zimmerman orders pork chops, but his assistant brings him a salad instead, claiming it's more healthy. I grew up with TNG in which I remember Riker saying that they no longer killed animals and Picard saying they didn't exploit them anymore. And I understood that anytime I saw them eat meat it was replicated meat, or would allow it in the position of honoring another species traditions. I always assumed they were vegetarian and no longer exploited animals and never questioned it - until branching out into other Star Treks that is. Like how Dr Phlox has a small zoo of lab animals on the Enterprise. Which I felt contradicted what I heard Picard and Riker say in TNG. But I assumed humans may still be too young then. But then in the new movie Into Darkness- they have Tribbles as lab animals. I have a hard time believing that as a more evolved and ethical species- we would not become vegetarians. ESPECIALLY considering our ties with Vulcans and how Vulcans showed us so much more than we knew of life. In reality- I think their ways would have taken more of a hold on us. And helped shape our evolution. It just makes sense that they we would be deeply culturally impacted by them. My opinion then is that even those that watch Star trek- are not as evolved and advanced as the characters they imagine in the future. Most people simply do not want to face that their own practices are illogical, irrational, or less evolved than they could be. It would be like showing a culture of slavery an image of a future with better versions of themselves where they no longer kept slaves- they would not believe it or allow it to be their understanding of what being "better" would entail. fictional story or not- People do not like to face certain things in themselves. So I believe the answer to this is a matter of opinion- and a matter of what each individual can reflect from themselves. Roddenberry: It would have to be similar to the philosophy of Star Trek because Star Trek is my statement to the world. Understand that Star Trek is more than just my political philosophy. It is my social philosophy, my racial philosophy, my overview on life and the human condition. I have been able to comment on so many different facets of humanity because both Star Trek and Star Trek: The Next Generation have been so wide-ranging in the subjects they’ve covered. My philosophy about the use of animals has changed. I am not yet a vegetarian, but I don’t feel comfortable as a meat eater knowing a lot of the things that go on to put meat on the table. Alexander: I remember the character of Commander Riker on the current series commenting on how it was no longer necessary for animals to be raised for food. Twenty-fourth century technology could create an analog of meat so that all the things associated with bringing meat to the table were no longer necessary. Roddenberry: I look forward to that day coming. We would have our juicy T-bone steak without having to kill the animal. I feel different way about domestic animals now. I am a bit queasy about the way we raise our chickens and beef cattle and so on. It’s really ugly. Alexander: You’re talking about factory farms? Roddenberry: Yes, it is just not a good thing. I also look forward to when we will contact other races and other life forms. What will our attitude be toward them? If we are not careful, we may see sentient life that is so different we won’t realize it is sentient. Because the creatures we meet don’t act and interact as we do, we might consider them valuable — much as many people disdain dolphins and whales today. Alexander: I was just thinking that we are not particularly good with the other sentient beings on our own planet. Roddenberry: On the hand, we are making marvelous progress. We humans are really growing rapidly now. It is largely a product of television and communications. Our attitudes are changing with remarkable speed. I am glad to be in drama, because I think that I, along with other writers, can make great changes in our world because of the power of sound and image that is often as real to people as their own lives. Commander William T. Riker: We no longer enslave animals for food purposes. Badar N'D'D: But we have seen Humans eat meat. Commander William T. Riker: You've seen something as fresh and tasty as meat, but inorganically materialized, out of patterns used by our transporters. In season 6, Episode 26 of Deep Space 9; at the end of the episode, Sisko is in an alley in the back of his father's restaurant cleaning oysters in New Orleans. I am assuming at some point they will be served in the restaurant. If they were replicated oysters why would he be cleaning them? It only makes sense that a civilized culture that moves into space relinquish the savage history of animal captivity and slaughtering for human ingestion. Also enlightened humans will all start to realize ( supported by science ) that animal matter isn't healthy for human consumption ( there are plenty of articles, go read! ). There is even an episode in Star Trek TNG where the state that they no longer kill animals, I believe with the Antican's (sp? ), etc. Not the answer you're looking for? Browse other questions tagged star-trek food . Do Enterprise-era humans hunt for food or not? Is obesity ever addressed in Star Trek? Is there a fully sentient android race in Star Trek? Why does human racial diversity exist in Star Trek?